A living will is also often referred to as an advance care directive (ACD), but what is it really? A living will communicates your end of life wishes if you are unable to speak for yourself. Different stages of life require looking at this document from different perspectives. But, no matter your age, getting this document in place will help your family make important decisions based on your wishes, versus letting them guess what you would have wanted. As a primer to this review, we recommend the GYST Guide to Living Wills. If you live outside the U.S. or are an expat living in the U.S. please visit the GYST Guide to Online Will Services For Canada, Australia, United Kingdom and New Zealand. Our GYST Review was conducted in April 2016 and we evaluated five different services: CaringInfo, Five Wishes, Rocket Lawyer, LegalZoom and Willing. CaringInfo and Five Wishes are focused primarily on the elder marketplace and the late stages of life. Their technology is a little more dated, but they both address the concerns of aging in a very dignified and human way, that make those quirks easy to overlook. Rocket Lawyer and LegalZoom have both been around for more than a decade and offer many options, security and functionality while Willing is a new entrant in the online legal field, and offers a friendly interface, and basic functionality. These last three all offer basic living wills that are good options for a healthy active person, and put a solid plan in place for you in case of an emergency. They all offer additional estate planning documents with various pricing and packages which can be handy. The Five Wishes living will document is part of the national end of life non-profit called Aging with Dignity. Their mission: “Helping to make dignified care a reality for all.” There is no contest, they hands down win for the most detailed, thoughtful, compassionate and human questions that document how you want to be cared for at the end of your life. 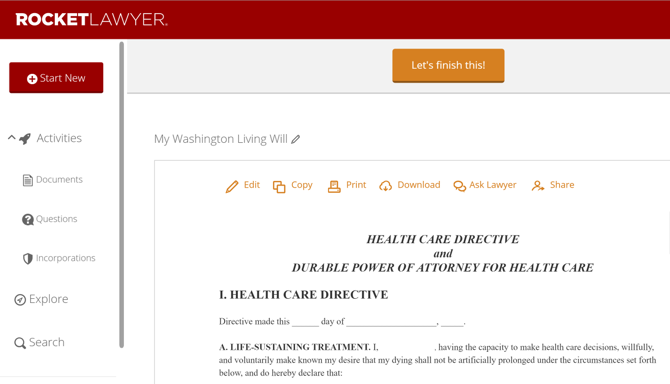 Available in 28 languages, it meets the legal requirements for an advance directive in 42 U.S. states and the District of Columbia. In the other eight states they suggest your completed Five Wishes document be attached to your state’s required form. ( See GYST’s Free State Forms if you live in one of those states. ) This is a high quality service to use with elderly parents, it covers everything from whether you would like to be kept clean and warm, to what you would like done with your final remains and everything in between. The instruction are easy to follow and the cost to download the form is $5.00 or you can print it out and fill it out by hand. Tips and advice are included on how to store and share your document. The site does meet the minimum bar for security with SSL encryption. There is a HelpLine at 800/658-8898 or email in case you have any questions and a very comprehensive resource section with more guides and information on end-of-life issues. They do not offer live chat or answers to legal questions. When you register for Five Wishes, you have access to edit, review or print your document for a year. The final document is a PDF. You can access your document to make edits after one year for $3. CaringInfo (formerly known as Caring Connections) is a national consumer education and engagement program of the National Hospice and Palliative Care Organization (NHPCO). 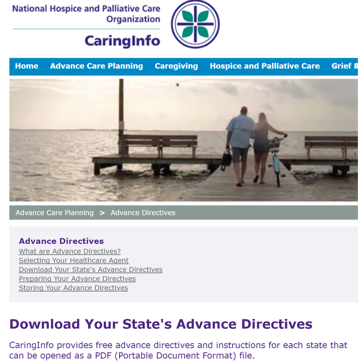 CaringInfo provides free advance directives and instructions and advocates discussing end of life wishes before a crisis. There are free templates in PDF format for each state. Each template has clear and concise instructions on how to fill out the document and important items to specify. There are also tips on completion: what to do with it, and who to share it with. They do not have additional estate planning forms beyond the living will. Because all the documents are downloadable and provided for free there are no real security or safety issues. There is a HelpLine at 800/658-8898 or email in case you have any questions and a very comprehensive resource section with more guides and information on end-of-life issues. The easy to download templates do not have the ability for ongoing revisions or edits to the documents, but that said it is fairly straightforward to re-do the forms if you need to make changes, under 10 minutes. Their motto is, “Legal Made Simple,” and they are doing a pretty good job of it. They are one of the larger online legal offerings and have all the estate planning documents in addition to offering the ability to talk with an attorney, and providing a guarantee on their documents. The Rocket Lawyer living will questionnaire is professional and covers both the appointment and contact information for your health care agent and many final life stage choices for $5. They have a comprehensive guide before you even begin the process and preview the final document as you go through each step. 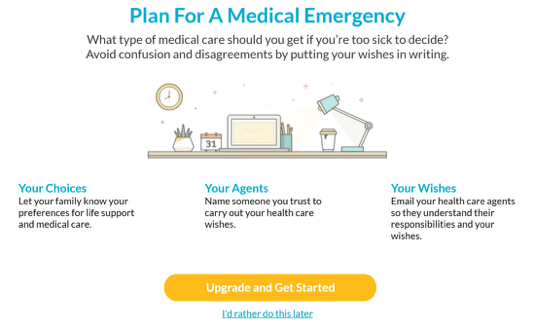 They are missing some of the additional detailed instruction that Five Wishes lay out in detail that pertain to the very last stages of life, but they cover what you need in case of an emergency. They also offer a complete online will and power of attorney documents, check out our GYST review of this service. This will seem like a great option when grouping other documents like a will, power of attorney and a living trust. Rocket Lawyer will store your documents for a fee with Document Defense, and they do not sell or use your personal data. They use SSL and 128 bit data encryption to protect your data with Norton Secured Seal. They also have contract signing with digital signatures, and secure cloud storage. Rocket Lawyer provides live chat, phone support, and directly within the questionnaire you can leave a questions for an attorney and they will email you within one business day. Lastly, but important for the DIY type, there is plenty of built in support, detailed answers to questions and extra explanations for terms legal terms. Editing your questions is relatively easy, although you do need to step through all the steps to find the one you want to edit. Rocket Lawyer allows you to edit your document at any time even if you have cancelled your account, they still keep your sign in and make your documents available. This could be useful if you want to update contact information or as situations change over the years. One of the largest sites for online legal resources, LegalZoom has easy to follow instructions for completing your living will, it is similar to RocketLawyer, with the ability to talk with an attorney and multiple legal documents available for packaged pricing. A basic living will document starts at $39, but part of the benefit of using a large company is the ability to bundle other documents and get it done at the same time. The will, living will, power of attorney bundle is $149, and they do have the option of a Living Trust bundle with a slightly more specific will. 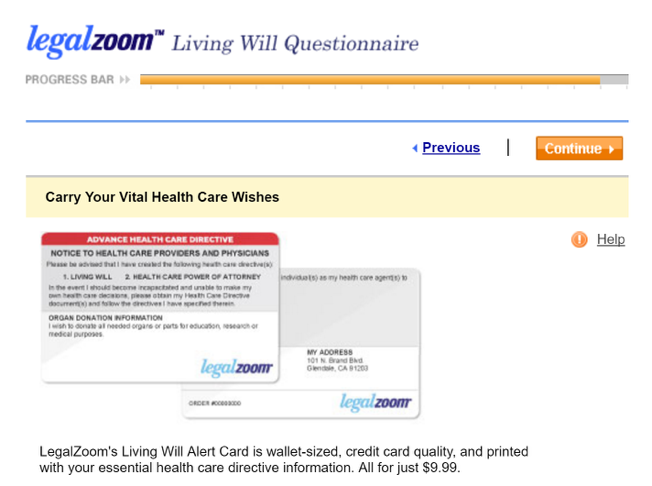 They also have a, “living will alert card,” for an additional $10 that has all of your directives on a wallet size card with your health care agent contact information. LegalZoom provides a final professional review of all documents to make sure they do not contain typos or other issues. The Better Business Bureau has given their seal of approval as well as having TRUSTe’s stamp of approval for their privacy practices. They use SSL and 128-bit data encryption to protect your data with Norton Secured Seal. They also back up all their documents with at $50,000 guarantee of legal validity. They provide live chat, phone support, helpful tips and information throughout the questionnaire process. When you receive your final documents there are two additional documents with signing instructions, listings for notaries and a ‘Help Guide,’ for your will. During the questionnaire process it is easy to edit and save your work in progress. You have thirty days to edit your living will and if you go with the comprehensive package that includes a will, for $149 per year, you have a year to edit the documents. Willing is a newcomer in the legal space, launching in 2015. They focus on helping people complete all of their end of life planning documents in a very consumer friendly way and design. Their documents are very basic at this time, but keep your eye on them as they are frequently updating and learning from their customers. Willing offers a “Plan for a Medical Emergency,” or living will as part of a $50 package that also includes a will and power of attorney documents. The questionnaire is very friendly and very basic with approximately six questions, two of which are for contact information for your health care representative. It is best for younger people who are healthy and just want a simple plan in case of an emergency. They have SSL encryption, but they are still a newer organization and they don’t have some of the privacy and security that the others in this category have like TRUSTe’s or Norton Secured Seal. Their documents are downloaded as PDF’s. Willing offers phone support or by email. There is no apparent way to search the site for answers to questions, although along the way in the questionnaire there is good support and useful information. Easy to edit and there are no restrictions on making changes. For example, let’s say you purchase the $50 package, there are no restrictions on making changes to any of the documents including your will, living will or power of attorney. That is a really nice feature, because having that flexibility to make changes can be costly with all the other packages and over time you might want to change guardians, add assets or change beneficiaries.